The new 16th Lok Sabha commenced its business on 4th June 2014. 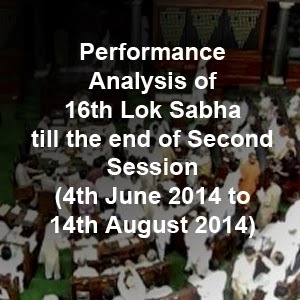 Till the end of Second Session (14th August 2014), the Lok Sabha had 33 sittings. This 16th Lok Sabha witnessed one of the most productive sessions in the past one decade. Though 14 hours and 1 minute was lost in disruption and forced adjournments, the members made up the business by sitting extra time of 30 hours and 45 minutes. 94% of the Budget demands were passed without discussions. 20 Bills were introduced and 13 bills were passed. 61 Private Members bills were introduced. 388 matters were raised under Rule 377 by the members. During Zero Hour, 607 matters of urgent public important were taken up by members. We analyse the performance of Parliament and MPs based on four parameters, viz. (1) debates, (2) private members bills, (3) questions raised and (4) attendance. Ministers cannot participate in debates, introduce private bills and raise questions. They also do not sign attendance. Hence, our analysis excludes the Ministers. During this two sessions, 443 members participated in 2475 debates, which includes, bills, matters taken up, etc. National Average is 4.9 per member for debates. Kerala MPs scored No 1 position with an average of 11.2 debates per member. Andhra Pradesh MPs occupy the last position with 2.8 debates per member. During these two sessions 61 Private Members Bills were introduced. 7 MPs have individually introduced 4 private members bills each. During these two sessions, 8854 questions (starred, unstarred, supplementary) have been raised by the members. National Average is 18 questions per member. Kerala ranks No1 among the states with an average of 44 questions per member. Uttarakand ranks last with 4 questions per member. The top performers for raising questions. The following MPs have shown top performance for the total tally till the end of second session. 152 MPs have attended all the 33 sittings and scored 100% attendance. National average for attendance is 87% per member. Tamil Nadu ranks No 1 with an average of 98% per member. J & K ranks last with 62% average. Both have secured 100% attendance. We congratulate all the top performers. Since many of the MPs are new, it is quite natural that they may find it difficult to get ramiliarised with the Parliament procedures. A real analysis can be done only after one year effectively. 1. 61 MPs have not participated in any of the proceedings of the Lok Sabha. Their total tally is 'zero'. 2. Actress Hemamalini (BJP, UP) with 'zero' tally has attended only 11% of the sittings. The readers can find out the performance of their MPs from the following link.